The analysis of detrimental anions (chloride and sulfate) in concrete digested with concentrated nitric acid is extremely difficult due to the high acidity, ionic strength and nitrate background of the digest. Employing capillary zone electrophoresis, chloride and sulfate in a diluted digest were separated simultaneously with full resolution in less than 6 min. An electrolyte comprising 10 mM lithium nitrate, 1 mM thiocyanate and 0.8% (v/v) 1-butanol at pH 6 was used. 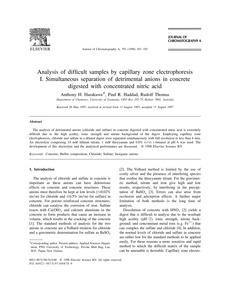 The development of this electrolyte and the analytical performance are discussed.